Desi Arnaz is best known for his role as Ricky Ricardo, Cuban bandleader husband of Lucy Ricardo on the classic American television series, I Love Lucy. But among other things, Desi Arnaz was a musician, recording artist, television producer and director. But his story begins with his birth in his beloved Cuba, before the regime of Fidel Castro. Desi Arnaz was born Desiderio Alberto Arnaz y de Acha, III on March 2, 1917 in Santiago de Cuba, to a wealthy family. Desi Arnaz grew up in an affluent family in his native Cuba; his paternal grandfather, for example, was one of the co-founders of Bacardi Rum. In addition to weath, his family believed in service to their community; for instance, his father served in the Cuban House of Representatives and became the youngest mayor that Santiago had ever had. All this changed after the 1933 revolution that overthrew the American-backed President Gerardo Machado, The 1933 revolution led by Fulgencio Batista landed Desi’s father in jail and stripped the family of its wealth, property and power. His father was later released due to the intercession of U.S. officials. Desi Arnaz and his parents fled to Miami, Florida, along with many other refugees. Greatly reduced in circumstances, the family worked at whatever odd jobs they could find; according to his autobiography, A Book, among other things Desi Arnaz worked at cleaning canary cages, and later as a painter. Desi Arnaz began his performingas a musician in 1936, playing guitar and percussion for a Latin orchestra. He then took a pay cut to work in New York City for Xavier Cugat, his mentor. Shortly afterwards, Desi Arnaz returned to Miami to lead his own band. It was there he introduced American audiences to the dance known as the Conga Line, which swiftly became craze. Desi Arnaz became a successful recording artist. In 1939, Desi Arnaz starred on Broadway in the successful musical Too Many Girls. He then went to Hollywood to appear in the 1940 movie version at RKO, he met and fell in love with his co-star actress and comedian, Lucille Ball. After a whirlwind courtship, Desi Arnaz married Lucille Ball. Desi Arnaz appeared in several movies in the 1940s, most notably Bataan (1943). After receiving his draft notice, but before his induction, Desi Arnaz injured his knee. Although able to make it through boot camp, Desi Arnaz was classified for limited service. Desi Arnaz ended up using his entertainment experience to direct U.S.O. programs at a military hospital in the San Fernando Valley. After leaving the Army, he formed another orchestra, which was successful in live appearances and recordings. After his television career began, he kept the band on his payroll as long as he remained an active producer. In addition, his musical career was very successful, with his signature song, Babalu, being released in 1946 and becoming a hit, as well as other popular songs such as Cuban Pete. Although his professional life was prospering during the 1940's, his marriage was not. Desi Arnaz is surprisingly honest, and refreshingly harsh on himself in his autobiography about his serial infidelities, which brought his marriage to the breaking point. His wife, Lucille Ball, filed for divorce in 1944. 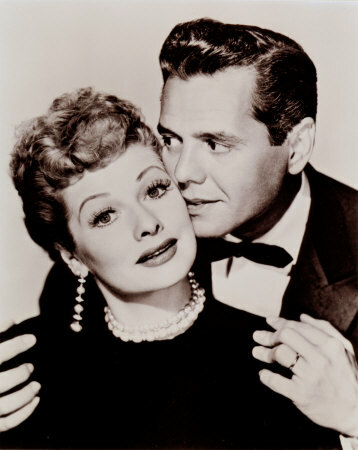 Despite his failings, Desi Arnaz truly loved Lucille Ball, and they reconciled before the divorce decree became final. Unfortunately, his infidelity and drinking became a recurring cycle in their marriage. Desi Arnaz produced, directed and starred in I Love Lucy, in which he played a fictitious version of himself, Cuban orchestra leader Ricky Ricardo, and starring his real-life wife, Lucille Ball, as Ricky's wife, Lucy Ricardo. I Love Lucy was based on Lucille Ball's successful radio show, My Favorite Housewife. In My Favorite Housewife, Lucille Ball played the part of Liz Cugat (later changed to Liz Cooper), a scatterbrained wife of a Midwestern banker, who was in turn was oppressed by his boss, played by Gayle Gordon. The radio show was a success, and CBS wanted her to star in a television version of the show. Lucy agreed, but insisted on having Desi Arnaz cast as her on-screen husband. Studio executives balked, feeling that viewers wouldn't accepts a Cuban bandleader as an acceptable head of a "normal" American household. Lucille Ball persevered, however, and in 1951 she and Desi Arnaz formed their own production company, Desilu, to produce the series. Lucy didn't want to move to New York, and so filmed the sitcom (as opposed to the lower-quality, less-expensive Kinetoscope) -- in compensation for the expense, CBS gave Desilu all rights to the finished product, providing them with a fortune in future syndication revenue. However, CBS executives were not impressed after viewing the pilot episode of the sitcom, titled I Love Lucy. To prove them wrong, Desi Arnaz and Lucille Ball toured the country in a vaudeville act, demonstrating the viability of the pilot to packed audiences. The CBS executives relented, and I Love Lucy went on the air, to become one of the most successful and beloved sitcoms of all time. Another success in Desi Arnaz's personal life occurred in 1951, with the birth of his daughter, Luci Desirée Arnaz on July 17th, after several previous unsuccessful pregnancies. With Lucille Ball, Desi Arnaz founded Desilu Productions. Desi Arnaz pioneered the multi camera setup production style using adjacent sets that became the standard for all situation comedies filmed before a live audience. The use of film enabled every station around the country to broadcast high-quality images of the show. Initially, Desi Arnaz was told that it would be impossible to allow an audience onto a sound stage, but he worked with the famous cameraman Karl Freund to design a set that would accommodate an audience, allow filming and follow fire and safety codes. In addition to I Love Lucy, Desi Arnaz produced December Bride, The Texan, Make Room for Daddy, The Mothers-in-Law, The Lucy Show, Those Whiting Girls, Our Miss Brooks, and the pilot episode of The Untouchables, all Top Ten shows in their time. However, the professional success of Desi Arnaz, Producer, inadvertantly led to the failure of Desi Arnaz, husband. As time went on, Desi Arnaz spent less and less time with his wife and family, to the point where he only saw Lucille Ball during rehearsals and performances. However, before that point there were many happy moments awaiting Desi Arnaz, in both his personal and professional lives. First, in 1953, his son Desi Arnaz Jr. was born. This had led to a major confrontation with network executives who were afraid of uttering the word "pregnant" , much less showing a pregnant Lucille Ball on television. Desi and Lucy persevered, however, leading to the ground-breaking depiction of the fictional Lucy's pregnancy, matching the real-life pregnancy of Lucille Ball. In 1954, Desi Arnaz and Lucille Ball starred in The Long, Long Trailer. Desi Arnaz expanded his producing abilities with Those Whiting Girls in 1955, and again co-starred with his wife Lucille Ball in Forever, Darling as well as James Mason in 1956. By 1957, Desi Arnaz's marriage had eroded severely. In an attempt to improve his marriage, he re-tooled the I Love Lucy show into The Lucy-Desi Comedy Hour, an hour-long show that ran once a month, giving Desi Arnaz more free time. However, Desi Arnaz continued adding more producing work to his schedule, such as "The Texan" (1958-60), "The Fountain of Youth" (1958), "The Scarface Gang" (1959). Lack of time, infidelity and Desi Arnaz's drinking finally became too much, prompting Lucille Ball to file divorce proceedings against Desi Arnaz in 1960 -- the day after they filmed the last episode of The Lucy-Desi Comedy Hour. Oddly enough, despite their divorce, Desi Arnaz stayed close to Lucille Ball, both personally and professionally. When Lucille Ball returned to television with The Lucy Show (1962-68), Desi Arnaz produced it. In 1963, Desi Arnaz remarried, this time to Edith mack Hirsch. He continued expanding his producing credits with The Mothers-in-Law (1967-69), as well as directing and ocassionally guest-starring. After this, his professional career slowed down, making a handful of guest appearances on various television series in the 1970's, such as The Virginian, Ironside, Saturday Night Live, The Tonight Show and Alice, and having a supporting role in The Escape Artist (1978). He had also written his autobiography, A Book. In 1985, his second wife, Edith, died. A year later in 1986, Desi Arnaz was diagnosed with lung cancer, and on December 2, 1986, he died of lung cancer in Del Mar, California, USA. His ashes were scattered at sea. I Love Lucy (1953) (unreleased compilation film of episodes from the show). I Love Lucy was never just a title! (After Lucille Ball was accused of being a Communist.) The only thing red about her is her hair, and that isn't even real. If you don't know what to do, don't do anything. Ironically, the radio show on which I Love Lucy (1951) was based, My Favorite Husband, was itself based on a book entitled Mr. and Mrs. Cugat. Desi Arnaz worked for Xavier Cugat during this time. For many years during their marriage, Desi Arnaz and Lucille Ball hid the fact that she was six years older then him by splitting the difference in their ages. She (born in 1911) said she was born in 1914 and he (born in 1917) also said he was born in 1914. In the film The Mambo Kings (1992), he was portrayed by his real-life son, Desi Arnaz Jr..
His grandfather was one of the original partners in the Bacardi Rum company. Desi Arnaz invented many techniques that are now taken from granted in sitcoms, including the use of several cameras to film the performance, preceding performances with a warm up man, performing before a live audience, and the re-running of old episodes. Desi Arnaz was instrumental in the creation of numerous classic TV series, in particular The Untouchables (1959). Author of the candid autobiography A Book, detailing his alcoholism and infidelities. He had planned to write a sequel, called Another Book. According to Mafia boss turned government informant Jimmy "The Weasel" Fratianno in his book "The Last Mafioso", several top members of the Chicago Mafia family were furious about the portrayal of Italians in general and the Mafia in particular in "The Untouchables" (1959), of which Arnaz was executive producer, and put out a contract on his life. Several mob hitmen hid in the bushes and behind trees outside his house one night after having been tipped off that he was on his way home and were going to shoot him when he pulled into his driveway, but for some unknown reason Arnaz never came home that night. The killers were supposed to come back again and wait for him the next night, but in the meantime cooler heads prevailed and the murder plot was called off. Arnaz apparently never found out how close he came to being murdered.